Today’s MindFULL Monday is also Memorial Day. I love Memorial Day. It’s a day to consciously remember people – some have sacrificed for our country and others are simply wonderful people I have had the honor of meeting along the way. Thoughts of these folks float across my mind, as this long weekend has us doing things around the house. 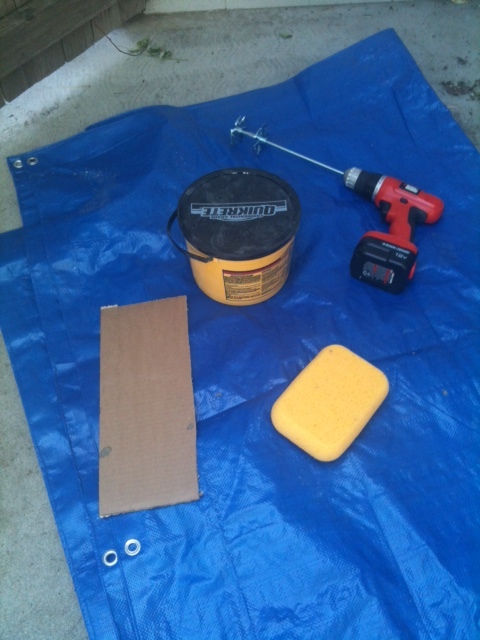 Some house projects are actually meditative for me. 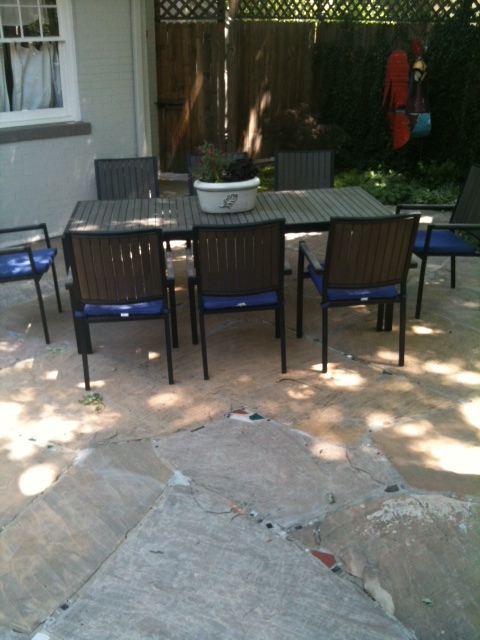 Like spackling the patio and laying broken pieces of pottery and tile between the pavers to add color and whimsy to our back yard. All it takes it a little Quickrete and a lot of patience. As my daughter moves toward a new chapter, I chose to take a plate she had made years ago and integrate it into the patio design. This way the chapter will always be present as we cross the patio to head out to new frontiers. Our friends have a twist on this story. I love their kitchen chandelier – it has pieces of collected rocks, family jewelry and colorful stones woven into the fixture. Their memories literally hang over them all the time. Some memories are like that. We take them and over years, re-set them. To all in my memory today, I say, “Thank You.” The pieces of knowing you set between my mental pavers have helped make for a colorful and textured landscape. And to those who are no longer with us, you are will always be set in stone. What MindFULL memories can you re-set on this special day? Let us know! Such leads the first chapter in the book that is currently serving as my lifeboat through these “weepy weeks.” Aptly named Transitions, Making Sense of Life’s Changes by William Bridges, it is the manna from heaven, fallen to feed my tossed about spirit. “The Weepy Weeks” is the name given by my daughter to these last two weeks of school. While admittedly ready to leave the small, thoughtful school she has been in for most of her young life, she is also comfortable and clinging to the known. Next year she heads to a large, inner city urban high school. From 15 in her 8th grade graduating class to a Freshman class of 650, the unknown looms on the streets of the city. Exciting and Scary. For both of us. Sounds familiar for many of us, in different ways, at different times in our lives. That’s because one of the things we can all count on is that at some point, we will be in “transition.” Jobs change, bosses change, births/deaths/ moving houses/cities, aging, illness, etc. happen to all of us. I can’t tell you the relief I felt when I remembered this phrase, for I could not figure out what was wrong with me. I was so out of my skin and my girlfriend, who always puts things in perspective, said that she and her husband are calling it “crying over chicken salad.” That is how arbitrary and often her tears seemed to flow. The book is elegantly simple yet profoundly insightful. It is actually a quick and helpful read. You will not only be the better for having read it, you will be able to recognize old ways of being and develop new ways of seeing. In your heart you’ll realize that chicken salad can be made 15 ways to Sunday and that you can make the most out of any way it’s made. Is there something you have used to help you navigate change? Let us know! I saw this post on Facebook and thought it was pretty funny, til my husband shared a story he heard on NPR about a man named Bernie. You have to read the interview below and then if you can find it, see the movie. Truth Is Stranger Than Fiction In Bernie http://www.npr.org/2012/05/07/152205689/truth-is-stranger-than-fiction-in-bernie?sc=emaf. I hear the movie is funny, touching and makes you think. After you see it, let us know what you thought! How do you MindFULLY stop yourself when you get mad? Let us know! Do you have kids heading off to college and need to furnish their dorm room? Know of someone setting up a new home or better yet, find yourself in need of a “Spring Spruce”? If so, how about MindFULLY seeing the chair in the corner of your family room in a new way or hitting your local re-sale shop for possibility! In our area, Consignment Furniture shops are all the rage. Check out the chairs below. I would have walked right by them. Not my style. But one look through my friend Colette’s (www.thehandygirlfriend.com) eyes revealed well kept grandmother’s chairs, in great shape, with great bones. And the price? $45 a chair. I spend more than that on a manicure and pedicure. 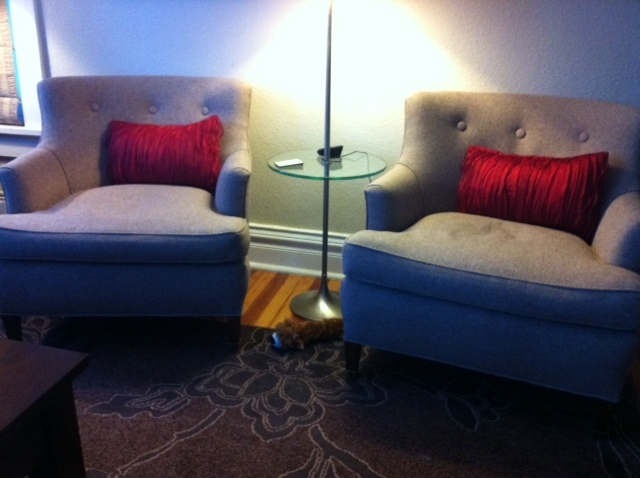 She bought the chairs for one of her friends, took them to a local upholsterer and had them redone. Sometimes, if you buy fabric through the Upholsterer, you can get a discount. Our guy gives 35% off. And he does a great job. 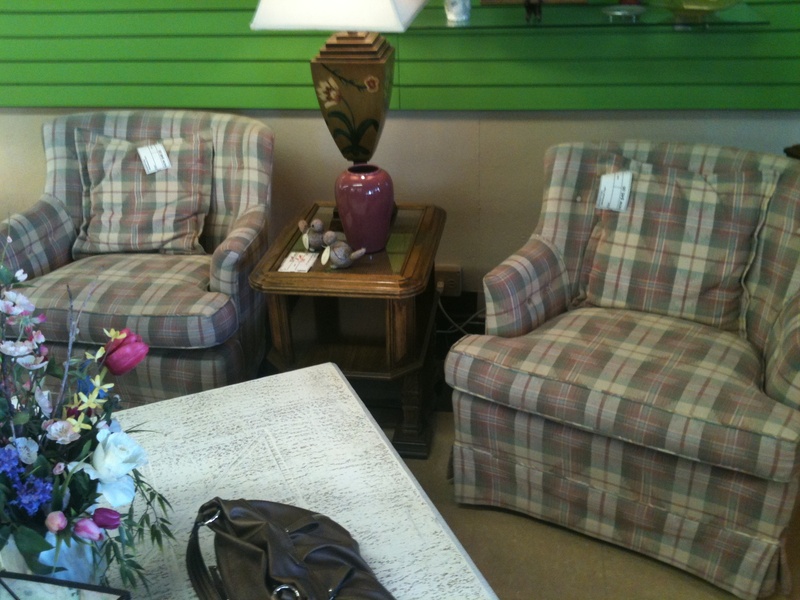 Notice the fabric covered buttons on the finished chairs. How clever is that? And they look like new. Positioned in her friend’s living room, Colette made them look like they fit with style and purpose. And all in, for less than $500. Below is a chair I did. My husband and I bought it over 20 years ago for our first apt at a garage sale. It was crushed yellow velvet with tan wood. Bluch. I painted the wood an iridescent silver and chose a traditional fabric with a sheen. 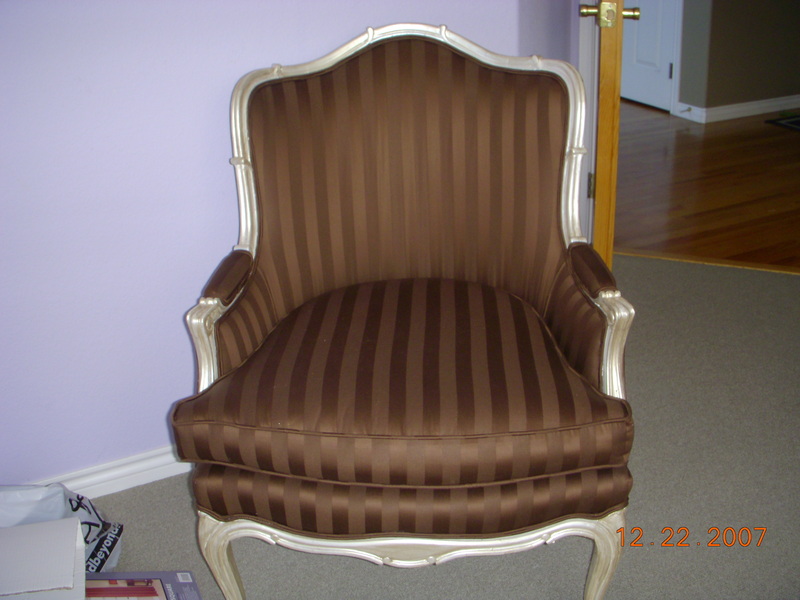 The chair cost $75 and the fabric and labor, all in, was around $300. We still use it. Have fun with this! Everyone deserves a chair to curl up in, why not make one you love? After all, for the cost of a day at the Spa, you can have a feeling of ease in your special chair everyday. 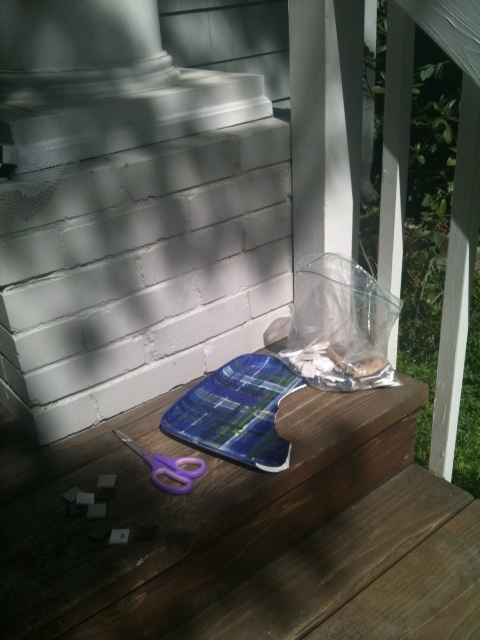 How have you MindFULLY breathed new life into something old? Let us know!